DESCRIPTION This three bedroom semi detached family home is situated in a convenient location just a short walk from the train and bus station and popular retail park. 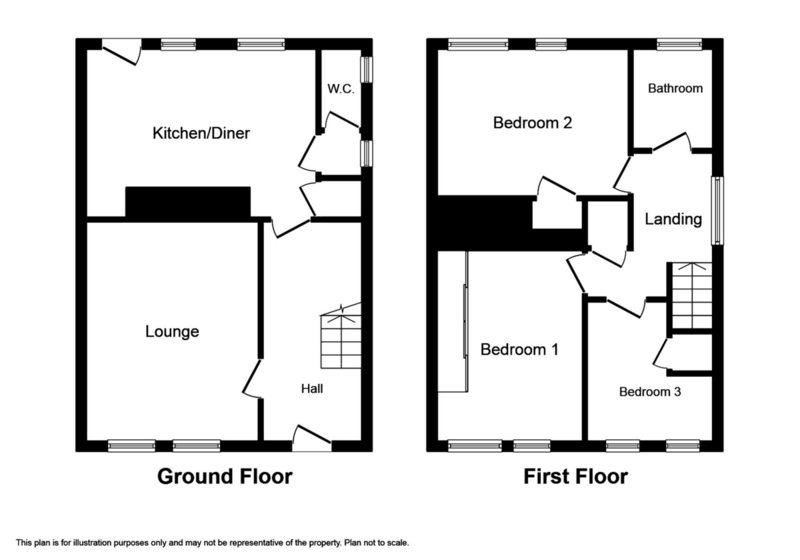 The property offers spacious accommodation with good size lounge, modern fitted kitchen with dining area and cloakroom. To the first floor there are three bedrooms and a modern family bathroom. It enjoys the benefit of uPVC double glazing, a driveway providing ample off road parking and a large rear garden which must be viewed for its size to be fully appreciated. RECEPTION HALL 11′ 6" x 6′ 5" (3.51m x 1.96m) With under stairs storage area, radiator, laminated floor and meter cupboard. LOUNGE 14′ 2" x 11′ 1" (4.32m x 3.39m) With a wall mounted electric fire, radiator, power points and two double glazed windows giving an aspect over the front of the property . KITCHEN/DINER 17′ 9" x 8′ 5" (5.43m x 2.59m) Having a range of fitted units in cream comprising wall cupboards, work top surface, one and a quarter bowl sink with base units beneath, gas cooker point, part tiled walls, power points, double panelled radiator, double glazed windows and door giving an aspect and access to the rear garden. LOBBY With a wall mounted boiler supplying the domestic hot water and heating system. W.C. 5′ 2" x 2′ 8" (1.59m x 0.83m) Having a low flush w.c. in white. LANDING With access to roof space and storage cupboard with shelving. BEDROOM ONE 11′ 1" x 9′ 7" (3.39m x 2.94m) Having fitted wardrobes with sliding doors, radiator, power points and two double glazed windows giving an aspect over the front. BEDROOM TWO 14′ 2" x 8′ 6" (4.32m x 2.61m) With radiator, storage cupboard, power points and two double glazed windows giving an aspect over the rear with views towards Prestatyn Hillside. BEDROOM THREE 8′ 11" x 8′ 1" (2.74m x 2.47m) maximum. With power points, radiator, storage cupboard with hanging space and two double glazed windows giving an aspect over the front. BATHROOM 6′ 3" x 5′ 5" (1.92m x 1.67m) Having a three piece suite in white comprising floating wash basin set into vanity unit, low flush w.c., panelled bath with shower over and splash screen, wall mounted chrome towel rail, part tiled walls and obscure double glazed window. OUTSIDE The property is approached over a driveway providing ample off road parking with paved gardens to the front for ease of maintenance. A gate to the side of the property gives access to the rear garden which enjoys a good size lawn garden, decking and children’s play area, free standing GARAGE with pedestrian access. Bounded by some brick walling and timber fencing. DIRECTIONS From the Prestatyn office turn left onto Meliden Road and at the mini roundabout turn right onto Ffordd Pendyffryn, continue through the traffic lights passing the bus station onto the rail way bridge and turn left onto Sandy Lane where the property will be found on the left hand side by way of a ‘For Sale’ sign.